I love olives. I’ve never met an olive I didn’t like except, perhaps, straight from the tree. Whatever you do, don’t eat an olive straight off the tree! But, I love olives. I grew up in the middle of California, in olive county. Yes, Spain, Italy and Greece may be known for their bold and flavorful olives but if you’ve ever popped open a can of black olives from the supermarket, chances are it came from California! I’m sure there are olive snobs out there that turn their noses up at the canned variety. It’s true that they are nothing like ‘real’ olives, but canned olives have their place. On American pizza, for instance. Or Nana’s tamale pie. And when you’re a kid, it’s fun to stick them on the ends of all your fingers and then eat them one by one. But we eat more than canned black olives in California. Growing up, someone was always giving out jars of home-cured green olives. Those were the best! And after I moved to Oregon, my favorite part of the 11-hour drive between my new home and my old home was stopping off in Corning, California at The Olive Pit to sample dozens of varieties of gourmet olives (remember the Olive You refrigerator magnet?). Canned, brined, oil-cured, salt-cured, marinated, spicy, salty, pimiento-stuffed, garlic stuffed, if it’s an olive, I’ll eat it! I even tried curing my own olives our first year in Sicily. Our first house here came complete with two olive trees in the yard. After some careful internet research and with some lots of meddling, I mean help, from my landlord who spoke not a word of English, I managed to water-cure some green ones and salt-cure some ripe ones. The truth is that they weren’t nearly as good as any of the olives I can pick up at the markets here so I didn’t bother with it the following year. But it was an experience that I’ll always remember. And I’m sure as the years pass by, my memories will slowly change until someday I’ll remember those home-cured olives as the best I’ve ever tasted. For the first two years here in Sicily we lived up in a small town on the base of Mount Etna (yes, the same Mount Etna that was recently spitting fire). We lived on the ground floor of a villa that was surrounded by a huge patio, which itself was surrounded by flower beds. We had bougainvillea, jasmine and climbing roses growing along the fences and the beds were filled with a variety of succulents interspersed with a couple olive trees and a big fig tree. We also had a lemon tree poking through the fence from my landlord’s property that supplied us with more than enough fruit each year. Yes, it was as nice as it sounded. No, we don’t live there anymore. Our house was burglarized towards the end of our first year (they took everything and trashed the place) and there were a couple attempted break-ins the following year. There are many wonderful things about living in Sicily, the high crime rate isn’t one of them. It was only a matter of time before the house would be broken into again and we didn’t have the option of moving to another house. The only way to break the 4-year Italian lease was through the military clause that allowed us to move into American military housing. So, reluctantly and with a few tears (on my part), that’s what we did. I miss our house, I miss the privacy, I miss being near a cute little Sicilian town (we’re pretty isolated here), I miss the olives and figs and lemons. But it’s not so bad. We still live in Sicily! I planted jasmine and bougainvillea in our backyard. We drive past olives and oranges and artichokes every day. I can use American as well as Italian appliances in our house because we have both types of electrical outlets in base housing. I don’t have to lock my front door. But back to the olives. My husband doesn’t eat olives. None of them. So when he’s gone, I have a tendency to put olives in everything! He’ll be back soon but this week I’m enjoying my regular snack of hummus with the special addition of Greek olives. I used a combination of green and black olives because I had half a jar of mixed Greek olives in the fridge. But you could use whatever olives you happen to have on hand. Even the canned black ones if that’s what you prefer! Put all ingredients into a food processor and process until smooth, scraping the bowl down occasionally. The hummus can be thinned with water if necessary. All amounts can and should be adjusted to suit your own taste! Serve drizzled with a bit of olive oil and a sprinkling of chopped olives, if desired. Serve with pita, crackers, corn chips or it can be used as a sandwich spread. Did you know that you can subscribe to Pinch My Salt by e-mail? Interested? Read about it here. I love olives! mmmm, The Vineyard Restaurant in our home town of Madera makes that yummy olive spread for their bread (in place of butter). I am a diehard fan of real butter on bread so it was hard for me to try something different on my bread, but I was glad I did! Yummm! If I remember well, you butter both sides of your bread Nicole...so healthy! hehe Did you make the bread in your photo? Looks soooo yummy My Grandpa used to cure olives and his turned out sooooo good. I love the salty taste, I would even continue sucking the bone in the middle because even that was good. That looks yummy! My husband is the same way as yours - he really dislikes olives. I might be able to sneak them in this way though, as I think it's more texture related than taste related. I mean... how could anyone dislike the taste of olives? The canned black olives are also perfect on a taco salad ;-). Some traditions die hard. Thanks for the hummus recipe, Nicole. I've been craving it lately and itching to make some from scratch (huh, I didn't even plan that little pun). So with this post, it's time! This is interesting! I haven't tried to put olive in hummus yet. Now that you have made it, I need to try out. That sounds great, Nicole. I may have to try this one. Nicole, I'm with you--I'm a complete and total olive fanatic! There are very few savory dishes that a few olives can't make better. I'm sorry your one attempt at home curing wasn't successful, but perhaps you should try it again. It would make for a good read, I reckon! I was actually eating hummus with celery when I clicked into this post! What are the odds? I agree, I love olives in any form, and this sounds like a fantastic hummus variation. Olives you say? Never touch the stuff. Although I do enjoy them on pizza, where you can't taste them. Surely I would enjoy them in hummus, as I can enjoy just about anything in hummus.You should try my garlic hummus with cream cheese and jalapeño jelly with toasted sourdough.In fact, I think I just made up something that sounds good. I like hummus and will definitely try this. 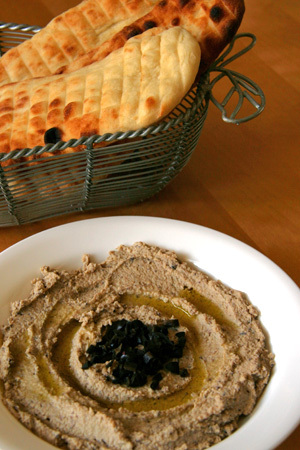 Olive hummus sounds great! Nice photos! I just remembered something I've done before that you might like . . . little hummus crostini with a swirl of black olive tapenade on top. Ruby: Thanks for letting the world in on my butter obsession! But I don't actually butter both sides of the bread. I butter it, eat the middle and then put more butter on the crust. :-) I like that spread at The Vineyard too...have never been able to figure out exactly what's in there but I'm pretty sure it's made with canned olives because it doesn't have a very strong flavor.Yes, I made the bread in the photo. It's my first attempt at naan, but I want to try making it again before I write about it.Kim: If it's a texture thing for him, I'm sure he'd love this as long as you don't give away the secret ingredient! As long as you process it well, the texture is smooth just like plain hummus.Lia: Of course they're great in taco salad! Now I'm craving my mother-in-law's taco salad. I'll have to see if she'll let me post the recipe on here, it's so good!Anh: I had never put olives in it before yesterday but it was a perfect combination, you should try it.Joe: You should, it's so easy and tasty (and healthy)!Brian: I love garlic-stuffed olives! I also love pickled garlic cloves. I pretty much love anything that is brined or pickled or heavily salted although I haven't tried pickled pig's feet or pickled eggs and I don't really want to. Anyway, glad you liked the post!Lisa: It wasn't that the home curing wasn't successful...it just seemed like a lot of work to get something that is so readily available here. Maybe I'll try it again if I ever end up living back in California because then I won't be able to pick up good Sicilian style olives whenever I want!Kalyn: Doesn't surprise me at all that you were eating hummus since I know you enjoy it as least as much as I do!Jason: What do you mean you can't taste olives on pizza? My favorite pizza is pepperoni and black olives because I like the taste :-) Your hummus/cream cheese/jalapeno jelly concoction sounds a little too, um, complex for my taste. I love cream cheese and pepper jelly though...mmmmmmmmm!Cynthia: I don't know many people who don't like hummus! Hope you get a chance to try this!Kevin: Thanks :-)Lia: That sounds great! I'm definitely a sucker for all olives, and do harbor love in my heart for the canned black ones...I think it's a childhood thing -- I totally dig them. This hummus sounds excellent -- I'm going to give it a try! How about garlic hummus cream cheese? Would that work? Nicole, I never have hummus without olives... I usually just pit some olives or use pitted, throw a bunch in with the hummus, and enjoy it that way. I also like to put a bit of powdered chilis on it, too, sometimes.With hummus, I use 'better' olives, but I'm still a sucker for the canned black olives... I used to put them on the ends of my fingers to eat them... But the olives are smaller now (or my fingers are bigger). I'll even admit that, when I'm in a time crunch, some Newman's spaghetti sauce on angel hair pasta with a handful of plain old canned black olives makes a decent quick dinner! Its virtual :(, I can't taste it but I can feel it:D... both of us love olives so I'm sure going to try it. Genie: I'm sure you'll love it!Jason: Sorry, just not a big fan of the cream cheese/hummus combo :-)Curt: You have great taste so it doesn't surprise me at all that you already make your hummus this way :-)Padmaja: Nice to "see" you :-) Hope you like it!Misslionheart: Oh no! I feel so lucky not to have any food allergies. I JUST made a double recipe of hummus...but I also put loads of garlic in mine..and was just thinking, 'hmm should I try some roasted red pepper, or olives this time..?' I didn't but wish I had!! Next time! i seriously don't think i have ever seen a prettier picture of hummus. great shots nicole! I just made a lovely calamata olive hummus. I'm of the belief that olives make everything better! Pictures look great! This is a really old post that I just came across. Great site! I have been putting olives in my hummus for years. Instead of just water I like to add olive brine as well. Depending on whether you use kalamata or green olive brine, you get a nice purple tinge to your hummus. Yum! What a fantastic blog. I love it and come often for the recipes and the stories. I was especially moved by your story about Sicily and getting broken into. In 1974-1976 we lived in Rome. Break-ins were common there too. All over Italy it seems. We have been robbed every time we have gone to Italy. A rent-a-car, hotel room, van broken into. Years ago, Norman Mailer moved out of Italy back to either LA or NY. He said he may get murdered in USA, but he knew he would be robbed in Italy and he got tired of the stress of never being able to have anything. We have never been robbed anywhere else except Italy, so far. And we have lived or traveled in places like Tunisia, Jordan, Germany, All of our Italian friends have been robbed too: car window smashed and contents ripped off while they are driving, stripped of their pocketbook at the bus stop, etc. etc. They have multiple bolts on their doors and windows, but still live in fear of getting robbed. Oh well. Italy is great for music, food, and more art and beautiful scenery than anywhere else, so I guess I will still go there, but leave anything of value home. Looks great. 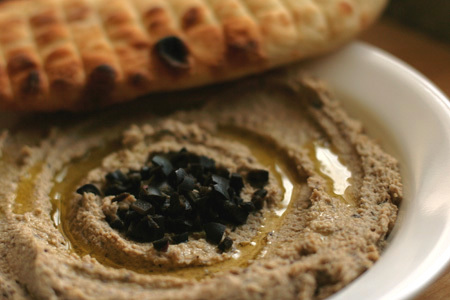 I will definitely try this olive hummus recipe at home in my holidays. Thanks.